The Yard-Man 24 Inch Dual Stage Snow Blower is much much smaller than the likes of the Yard-Man 28 Inch Snow Blower or the Yard-Man 30 Inch Snow Blower. It even has a smaller engine to match it’s smaller clearing width. This is a Yardman 0.18 liter, 4 stroke engine. This machine can be started by either plugging it in or by using the pull cord recoil system. Power on this self propelled snowblower is transferred to the wheels by a transmission that gives this Yard Man 6 gears when traveling forwards and 2 gears for when it’s reversing. This Yard-Man uses Snow Hog tires to grip the ground that it’s working on. Each tire has a width of 0.1 m (4 inches) on the ground. The snow in front of the Yard-Man 24 inch snowblower is cut up by 2 different devices (hence the name ‘dual stage’). The first device is the serrated steel auger. This auger fills the whole width of the snowblower’s housing. It rotates extremely quickly and will cut through even ice. Once it does, it moves the cuttings towards the middle of the housing where the impeller is located. The impeller has a diameter of 0.3 m (12 inches). This impeller further breaks up the snow, but more importantly it shoots it out of the chute at high speeds. The chute through which the snow travels is made from plastic polymer and guide the snow up to 10.7 m (35 feet) from the snowblower. The chute can be rotated from the operators station and has the ability to turn through 200 degrees. The Yard-Man 24″ 2 stage snow thrower also has a built in halogen headlight so that you can operate it easily where it’s dark outside. The weight of this machine comes to 88.45 kg (195 lbs) which is actually quite light when compared to similar sized snowblowers made by other brands. 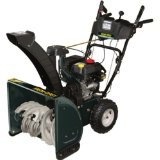 Click Here to buy the Yard-Man 24 Inch Snow Blower.